In many cases, end-users – even if they are power users with the knowledge to SQL, MDX, and other techniques, don’t have the right tools available to solve the tasks. Instead, much work is done manually and error-prone. But from our experience, it is not possible to completely prevent such power users from obtaining data from source systems, preparing it, and eventually reporting the data to upper management. What organizations need is a compromise between IT agility and data management that allows power users to obtain the data they need quickly, in a usable quality. To overcome these problems, the Data Vault 2.0 standard allows experienced or advanced business users to perform their own data analysis tasks on the raw data of the data warehouse. In fact, a Data Vault 2.0 powered IT welcomes business users to take the data that is available in the enterprise data warehouse (either in the Raw Data Vault or in the Business Vault) to create local information marts using specialized tools. These tools retrieve the data from the enterprise data warehouse, apply a set of user-defined business rules and present the output to the end-user. IT might also create structures where organizational-wide business rules are applied to provide a consolidated view on parts of the model or pre-calculate KPIs to ensure consistency among such calculations. Because both types of data (raw data and business rule applied data) is already integrated, the business user can also join consolidated data with raw data from specific source systems. This approach is called mSSBI, where IT evolves to a service organization that provides those power users with the data they want, in the timeframe they need. The data is integrated by its business key and can be consolidated as well as quality checked. In this case, power users who build their own, custom solutions can write back data and information into the Enterprise Data Warehouse by leveraging a dedicated user space for this purpose. The write-back can then later be re-used in the solution for information delivery. Furthermore, the business users can manage their own master data by using an MDM application. It enables authorized business users to change the parameter values and therefore influence the results of the business rules. 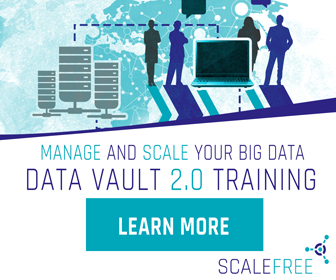 The difference between “managed” Self-Service BI to the standard Self-Service BI approach from the general industry is that Data Vault 2.0 provides a managed environment where data and information are provided in a controlled and secure manner. Power users can only query the data they are allowed to see from a data security perspective. Another advantage is that this approach enables organizations in security and banking industries to provide a fully auditable and traceable environment that meets highest security requirements. Managed Self-Service BI does require a write-back possibility in the enterprise data warehouse architecture, otherwise, it’s just plain old BI solution. Without write-back, there are no differentiators. Beyond that, write-back is necessary in order for enriching or enhancing the quality of the data being put forward. Data scientists, for example, do this all the time: when using Hadoop they create a new target file as a result of their processing output. This is a direct write-back in the Hadoop space. We have required write-back in Self Service BI for years, otherwise, master data, and hierarchy management doesn’t work properly.